Sorry I haven't posted in so long. My husband got laid off from his job three weeks ago and I kind of was in a tail-spin. Blogging has been the last thing on my mind. I am so grateful for family members and my church to give us reassurance and knowing they are there if we need anything. We have been doing good, but have a very limited budget for food so........... I've been trying out some food storage meals lately and it's been going great! I know I post a lot of recipes from Mel's Kichen Cafe, but she's so awesome! 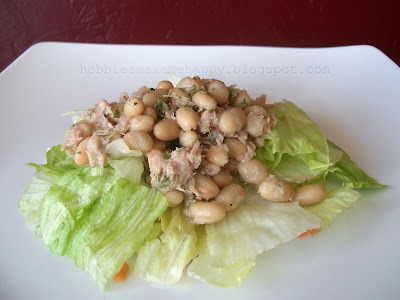 I love her and when I found this simple recipe for a light tuna salad, AND I had all the ingredients on hand, I had to try it. Boy, am I glad I did! Such a delicate, light salad that mixes so well with crunch, crisp lettuce. I gobbled it all up. In a small bowl, sprinkle some of the lemon juice over the chopped onions while you prepare the other ingredients. This will take some of the oniony edge off the onions. Drain the tuna and put it into a large bowl. Add the beans to the tuna and gently stir to combine. Add the onions, parsley, black pepper, lemon zest and lemon juice and mix to combine. Add Tabasco or hot sauce to taste. If the salad needs more acid, add a little more lemon juice. If the salad seems a little dry, add a little bit of olive oil. Add salt to taste. Serve chilled or at room temperature. The salad develops great flavor if tightly covered and refrigerated for a couple hours, or up to a day, before serving. Serve with crackers, lightly toasted bread, lettuce cups/leaves, fresh vegetables, etc. Oh! That DOES look tasty!!! I'll have to bookmark this one. I LOVE tuna AND beans! Are you familiar with www.bountifulbaskets.org to get really great quality and amazing prices on your produce? If not, check it out. You'll be glad you did. Also, what field does your hubby work in? Has he had any luck finding a new job? Sending out prayers and good wishes vibes!!! I like the idea of having white beans with tuna. It sounds like a great recipe. Thanks for posting! I actually do bountiful baskets occasionally. I feel bad when I don't use all the stuff by my mother pointed out she doesn't use all the stuff she buys at the stuff either so maybe I should stop feeling so bad and just do it more! I do love it when I get it. Hubby is a CPA. No job offers yet but lots of interviews. We're still hopeful!